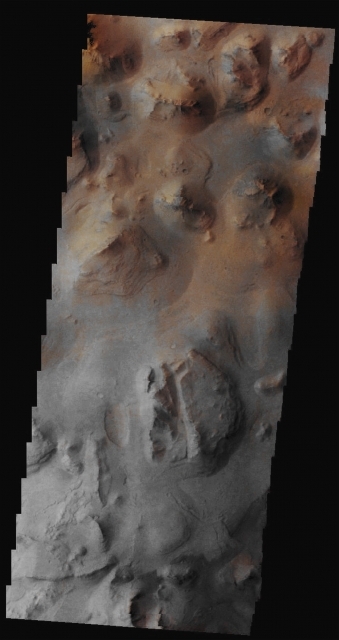 In this fantastic VIS image, obtained by the NASA - Mars Odyssey Orbiter on November, 4th, 2009, during its 35.008th orbit around the Red Planet, we can see a Chaotic Sub-Region located in the Martian Region known as Eos Chasma. Eos Chasma is a Chasma (---> such as an Abyss) located in the Southern Portion of the Great Valles Marineris Canyon System, in the Margaritifer Sinus Quadrangle of Mars. Eos Chasma�s Western Floor is mainly composed of an etched (---> meaning highly corroded) Massive Material that is composed of either Volcanic or Aeolian Deposits which were - in eons - eroded by the action of the powerful Martian Winds. On the other hand, the Eastern End of Eos Chasma shows a large area of Streamlined Bars and Longitudinal Striations. These Features are interpreted to be Stream-carved Plateau-like Deposits and - maybe - Materials (---> Rocks and Dust) transported and deposited over there by flowing Fluids and Winds, respectively. Just out of curiosity, Ganges Chasma is an offshoot (---> such as an appendage, or a branch) of Eos Chasma and the (now decommissioned) NASA - Mars Reconnaissance Orbiter (or "MRO", for short) discovered, among many other things, Sulfates, Hydrated Sulfates, and Iron Oxides in this interesting Martian Region. This image (which is an Original Mars Odyssey Orbiter falsely colored and Map-Projected frame published on the NASA - Planetary Photojournal with the ID n. PIA 20424) has been additionally processed, magnified to aid the visibility of the details, contrast enhanced and sharpened, Gamma corrected and then re-colorized in Absolute Natural Colors (such as the colors that a normal human eye would actually perceive if someone were onboard the NASA - Mars Odyssey Orbiter and then looked down, towards the Surface of Mars), by using an original technique created - and, in time, dramatically improved - by the Lunar Explorer Italia Team.